Who is Doctor Energy Smart®? Doctor Energy Smart® is a group of home improvement professionals with the cure for your sick energy bills. 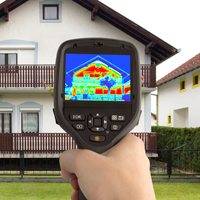 We use thermal imaging to diagnose and remedy your home's symptoms for the health and comfort of your family, and to put savings in your wallet. Like a sick patient, your home may not be running or breathing efficiently. Lots of energy is being wasted just trying to maintain a consistent temperature. Many symptoms are not easily recognizable by the naked eye, and a thermal infrared camera combined with a trained technician will find the most troubling areas of air and heat leakage in your home. The Doctor is smart about saving you on energy bills and is ready to make a house call. A thermal imaging camera, sometimes referred to as a thermal imaging gun, uses infrared light (heat energy) instead of normal visible light to form an image. It can see the slightest differences in temperature, which means finding the best places to attack energy leakage. This room corner looks pretty normal. What could be going on here? A thermal energy audit from Doctor Energy Smart® helps you see exactly where you are losing energy and money in your home due to poor insulation and air leaks. With the coldest spots in blue, you can now see that there is an energy leak in the corner. Read more about thermal imaging here . How will Doctor Energy Smart® save me money? For every minute your furnace or air conditioner is running, energy in the form of electricity, natural gas, oil, propane, wood, or coal is being used. This wasted energy costs you money in monthly bills, fill ups, and deliveries! By properly sealing leaks and insulating your home, you can drastically lower your utility bills, even while heating and cooling prices rise! A Competitor Gave Me A High Price Quote. Can I Expect The Same From You? It's a real shame when an insulation contractor charges you to fill every wall and spray every crevice only to miss a large leak along the sill beam under the house, missing a huge loss of heat. With a proper audit or simple assessment, the real problem could be addressed first, saving the homeowner from paying for unnecessary work. When a skilled Dr. Energy Smart technician comes to your home for a thermal energy audit , the largest problem areas are attacked first. This will help you save money by not spending on unnecessary work. Check out our testimonials to find out more! Read all about Spray Foam Insulation and it's beneficial effects . Don't You Have To Break My Walls Open? Absolutely not! With our state-of-the-art insulation injection techniques, its a cinch to insulate your walls with a bare minimum of intrusion into your walls. Read more about insulation installed by injection here . Can You Remove or Work Around Existing Fiberglass Insulation? Absolutely! When properly installing foam, radiant foil barrier, or cellulose insulation, it's important to make sure that the old fiberglass insulation is either removed when necessary, or in the case of injection foam, pushed aside into the exterior side of the cavity by the expanding foam itself.